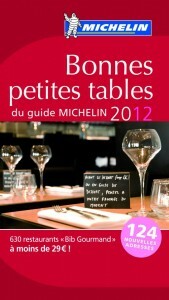 In anticipation of the February release of its Red Guide, Michelin has announced its Palmarès Bib Gourmand for 2012. The Bib Gourmand designation recognizes places that offer excellent three-course meals for less than €35. I incriminate laziness, and something that is called “suivisme” in French and does not translate well. Couldn’t possibly be piston/connections/politics? No, that’s too Anglo. Zerda is far from being a superior couscous. Bibimbap serves tasteless food. Again there are plenty of great couscous and Korean addresses in Paris, so why these? OK, Fredérick e. Grasser Hermé: OK.